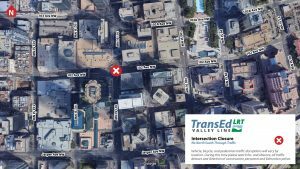 EDMONTON, AB – April 12, 2019 – Starting on or around May 10, 2019, the intersection at 101 Street and 102 Avenue will be fully closed. This closure is to accommodate work required to complete the intersection. It involves laying rail bed, track, and finally paving the lanes. This will be 24-hour work. 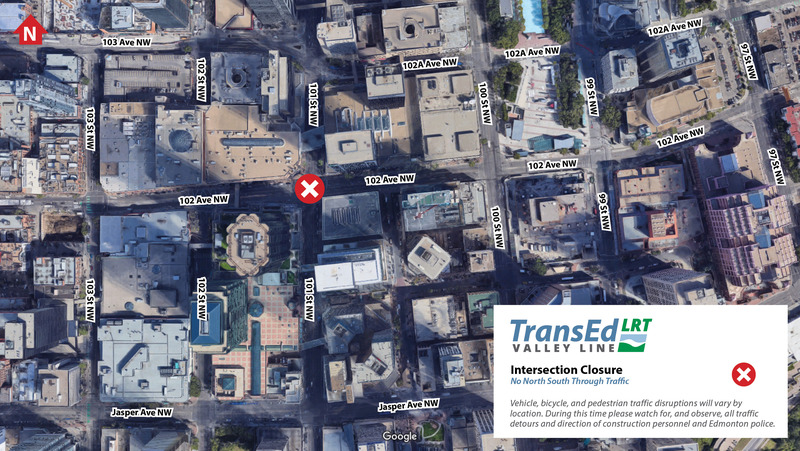 The intersection at 101 Street and 102 Avenue will be fully closed. Pedestrian access will be maintained. Access will vary so please watch for and obey all construction signage. This will require overnight work. Crews will have to perform all or some of this work during night hours. TransEd is aware that overnight noise is disruptive and has taken several noise mitigation actions in advance of this work. TransEd is committed to following all City of Edmonton bylaws and regulations and has obtained an overnight roadwork permit. *City of Edmonton Bylaw C14600.